More election dishonesty from Hs2aa. Having blown all their money (and that of a lot of taxpayers) on futile attempts to stop Hs2 in the courts the High Speed 2 Action Alliance (Hs2aa) is doing very little nowadays. However, it has produced a card to help support the ineffective ‘no votes for you with hs2’ campaign. It’s their usual mixture of spin & lies in the form of 5 loaded ‘questions’ that are supposedly meant to put MPs ‘on the spot’. I’ve dissected each for the benefit of those MPs who might not know how to deal with these loaded questions. 1). 452 MPs have already answered this by passing the Hs2 Hybrid Bill with a massive majority! Contrast that thumping total to the 41 MPs who voted against the bill. As Hs2 remains the policy of all the major political parties & all those likely to form the next Government I don’t think this one will bother any MPs. At the moment the Frecciarossa 1000 will be limited to speeds of 300kph. Sound familiar? Yes, it’s exactly what Hs2 have in mind. It’s worth remembering that Hs2 won’t be up & running until 2026 & who knows what speeds the next generation of high-speed trains will be capable of by then. So Hs2’s planned speed of 400kph is an eminently sensible choice that future-proofs the line – and Hs2aa are being dishonest with their claims (again). 3). ‘Adequate’ compensation. Ignoring the irony of Hs2aa (a group that’s lost dozens of court cases) talking about a lost court case, let’s remember one thing. That court case wasn’t about the amount of compensation, it was about the methodology of the compensation scheme. For some people, no level of compensation will ever be enough. In truth, the Hs2 compensation scheme is more generous than previous ones. No-one would want to see people compensated unfairly, but what all this is about is a cynical attempt to load more costs onto the Hs2 bill to make it seem unaffordable. 4). Cuts – yet another cynical ploy. We’re the 6th richest nation on the planet. The cost of Hs2 is spread over 18yrs at less than 0.17% of GDP (or around £2.5bn pa at the height of the projects spending). The idea that scrapping Hs2 will stop cuts elsewhere is nonsense. Where to cut is a political decision more than a financial one – and the different parties have different ideas on how & when to do it. 5). Hs2 ‘cuts £8.3bn of existing rail services’ This is Hs2aa’s biggest & boldest lie. I’m copying my original exposure of this to save you having to look for it. The cuts lie has also been nailed by the plans that have published to EXTEND rail services after Hs2 is built. As usual HS2aa ignore such inconvenient evidence as it shows them up for what they are, nothing but a deceitful bunch incapable of telling the truth. 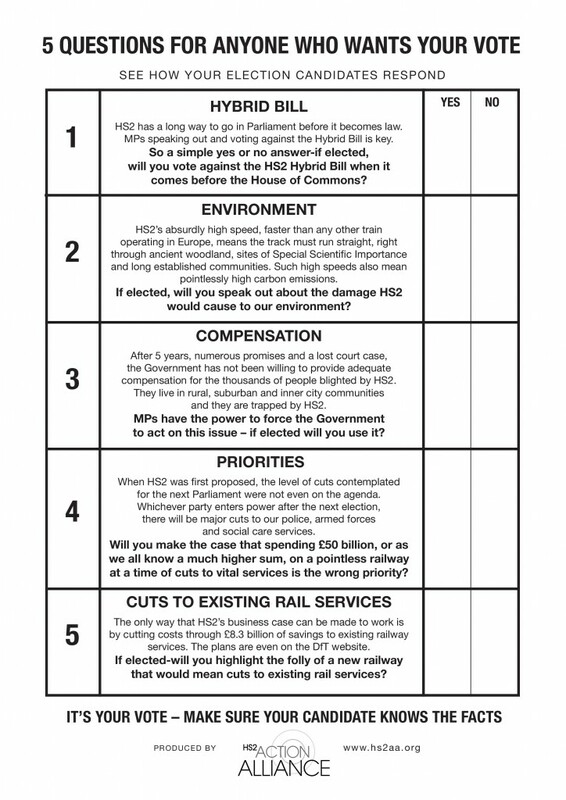 So, next time somebody waves around Hs2aa’s ‘5 questions’ card, feel free to link to this. 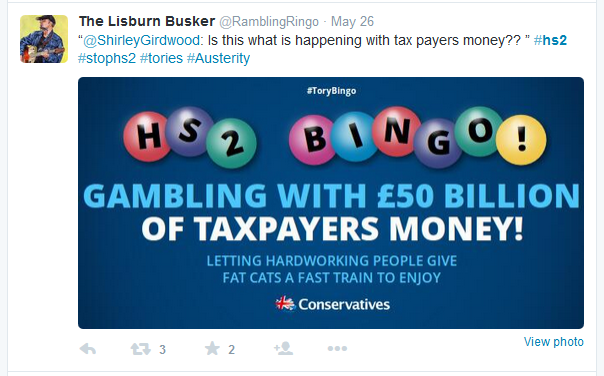 The anti Hs2 campaign in the last week of the election. 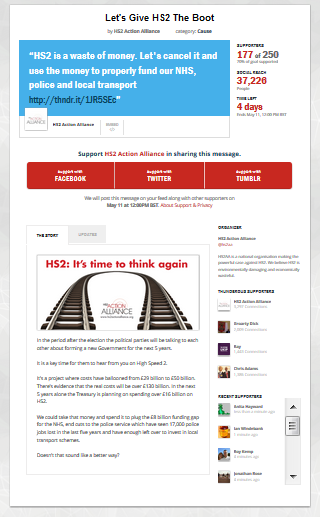 As we’re in the final week of the election campaign I though I’d take a look at how the anti Hs2 campaign’s going. The answer is – very badly indeed. 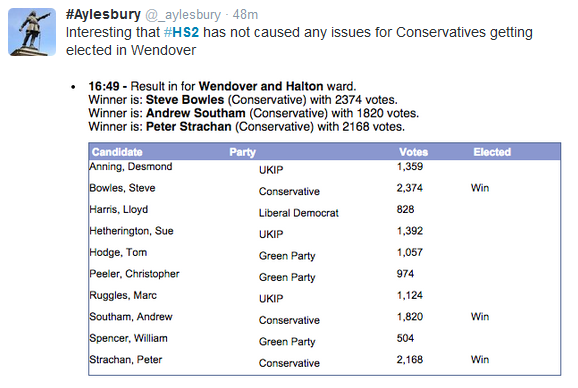 All political parties know that (in reality) the anti Hs2 campaign is tiny. It has little real support & commands fewer votes. To illustrate this fact here’s the latest antis social media ‘scores on the doors’. These are a record of the leading anti Hs2 groups & leaders following on social media (Twitter & Facebook). Note the usual caveat. 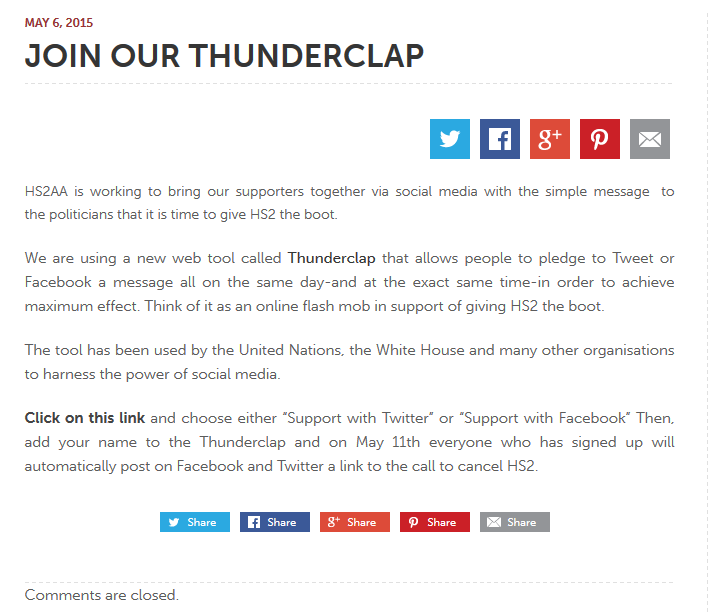 Not everyone following them opposes Hs2. Some followers are pro’s there just to keep an eye on them! To say the results are pathetic is an understatement. They started off from a ridiculously low base and have hardly made any progress since February.There’s been no election effect at all. To put their campaign numbers in perspective, the total number of UK parliamentary electors in 2013 was 46,139,900. I’d work out what % of the electorate is actually following StopHs2 or Hs2aa but I don’t have a calculator that works to that many zero’s! That’s not all. The main players (Stophs2 & Hs2aa) have been almost absent from the fray. Having run out of money & with a shrinking activist base they’ve relied on both UKIP & the Greens to make all the running. Their problem is – both parties are slipping in the polls. What will be interesting to watch is what happens to their campaign after the results of the election come in and it becomes obvious they’re a disaster for them.